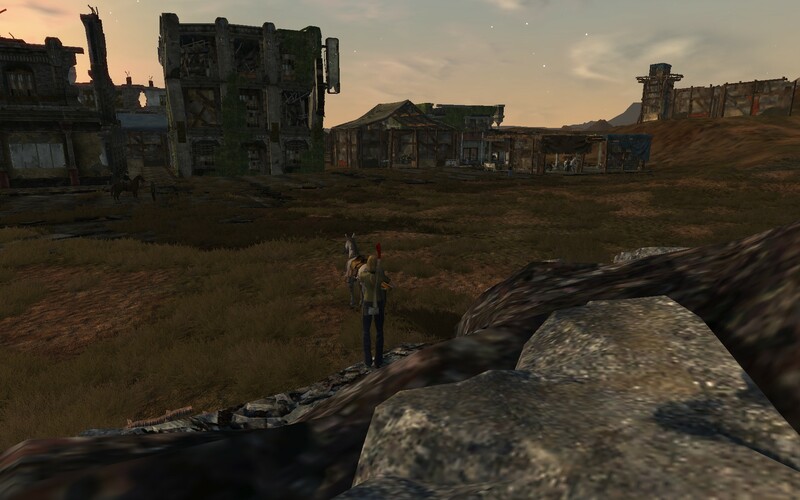 I hadn’t played Fallen Earth in a few weeks, so I decided to wander around in the Wasteland again. Ouch, it was a tough evening, as in difficult to play because I forgot quite a bit and/or had a challenging time just doing basic things! First up, I forgot how to enter “fight” mode. I finally stumbled on… the TAB key. This let me fight some nearby thugs and mine the copper they were guarding. After getting that sorted out, I went to clear two lingering crafting quests I had: Do No Harm, and Brewing Trouble. 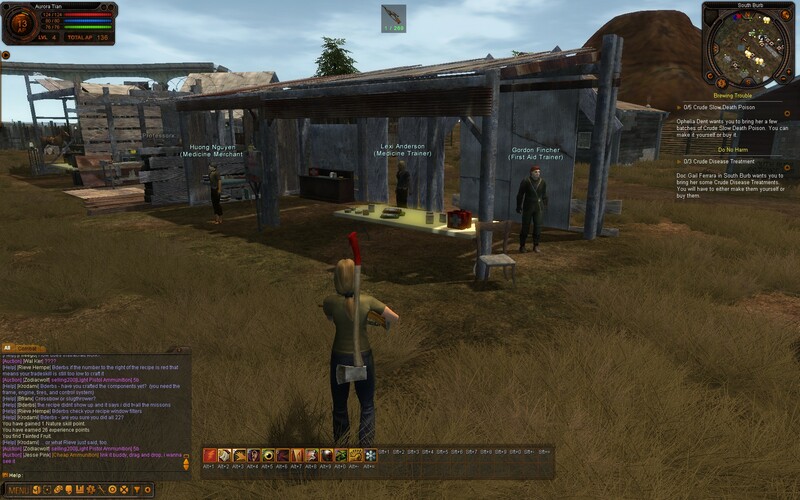 Both involved making supplies for the outpost, and involved items that were easily found or purchased. I went to the medicine crafting section in South Bluff and purchased some trade skill books, and soon enough was almost ready to craft the needed items. While fighting mutant prairie chickens looking for tainted eggs (needed for one of the potions), I leveled up. 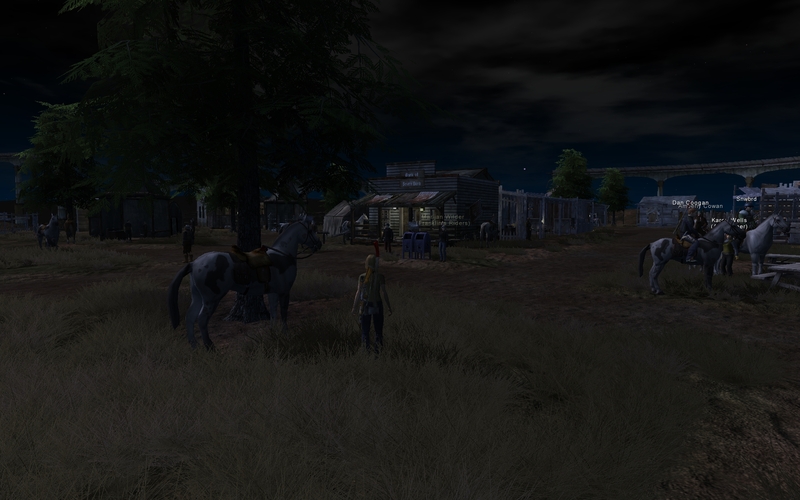 This opened up more quest givers and I got one that took me to the next larger outpost in the area: Embry Crossroads. So I saddled up my trusty horse and rode there… but just outside my horse slowed down and I walked in the rest of the way. I couldn’t figure out what happened, when it hit me: I hadn’t fed my horse so it was low on food and thus very slow. Oops, sorry about that horsey! Unfortunately I couldn’t figure out where to by extra feed – previously, I bought some at a garage outside South Bluff, but that would be a really long way to go on foot and/or a super slow horse, from Embry Crossroads. I wandered around to no avail; I need to find a garage near Embry Crossroads to get more horse feed. EDIT: I got a little more time to play later in the evening, and decided I couldn’t stand having my horse starve. Oh, and also be stuck walking everywhere. 😉 So I searched around and found the garage on the outskirts – basically head north out of Embry Crossroads, take a right, and it is right off the road after a bit. 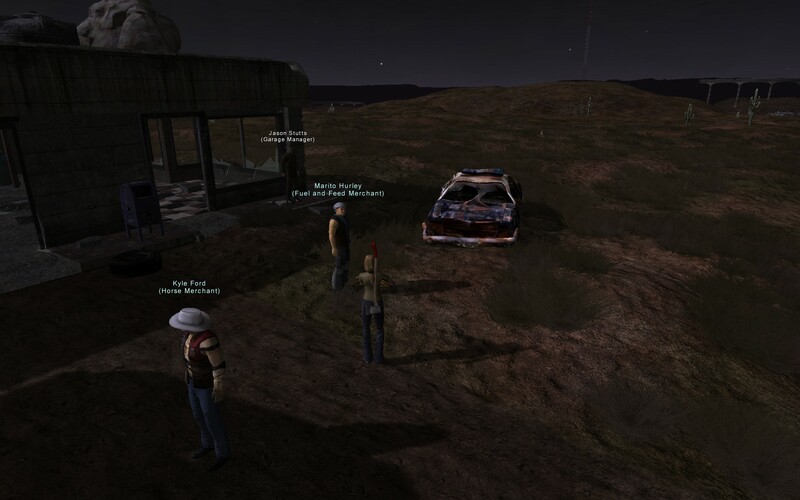 I attempted another quest, to collect DNA samples from four species surrounding Embry. I had to bumble around to figure out what to do here as well. The first species on the list was a creeper, so I search and found some of these scorpion-like animals. I fought and killed one, but the quest wouldn’t update. I didn’t have the skill to harvest it (needed my Nature skill to be higher) so I was stumped until I tried using the DNA kit in my inventory on a live creeper. That worked, except I died taking damage while taking the sample. I repeated this pattern two more times, including the deaths, for lizard and coyote samples. Fortunately, the prairie chicken didn’t kill me too, and I was able to get my fourth sample without dying. Fallen Earth has been on my list of MMOs to check out for many, many months. In an embarrassing admission, I bought the game in early 2010, before it went F2P. Then I got too busy to check it out, and I never installed it. When I heard it went F2P I was thrilled, because I’d be able to play a little bit and not feel guilty about a subscription. (The fact that monthly fees are an entertainment bargain is a whole ‘nother post. Besides, I am willing to support games I enjoy by buying stuff from in-game stores – the subscription thing is more feeling that I have to prioritize a game I’m paying for over one I’m not). Anyway, I finally decided to give it a go, and rolled up a character. The tutorial was fun, and covered typical ground: movement, interacting with objects, looting, equipping and switching weapons, combat, etc. It ended with a choice of starter area to travel to. I wasn’t sure, and since the list categorized areas by combat or crafting focus, I chose a crafting one, and soon emerged at South Burb as a Vista faction member. The two main halves of the South Burb outpost have a number of quests available, trainers, and merchants. I spent some time getting familiar with combat, doing some quests, gathering and crafting (of which there is a lot!). The difference between combat mode and exploration mode was something I had to get used to. It reminded me of Asheron’s Call, which also had a “fight” mode and a “movement” mode – something I haven’t seen in a game I’ve played since then! Two nits I have: the quest tracker doesn’t always work (popup when hovering the mouse over the X on the mini-map doesn’t consistently show for me), and the in-game map seems locked at a detail level (dragging it larger just makes it blurrier). But those aren’t really big issues that detract from the game as a whole. I’m having a lot of fun so far. The landscape and setting are a fantastic break from the fantasy world so many other MMOs use. Earlier I wrote that I will try out RIFT starting in late March, a few weeks after the game opens for everyone. Now I plan to squeeze in Fallen Earth first.